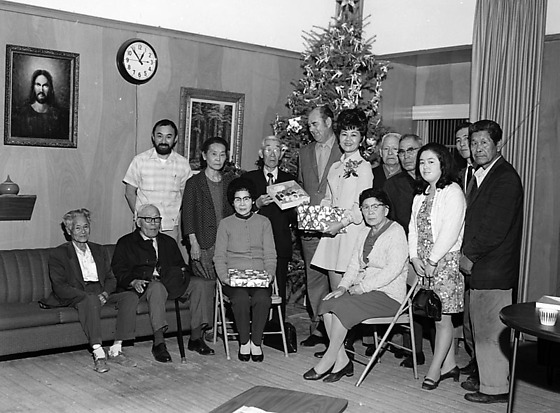 Reverend Donald Toriumi holds a box of mochi stands among a group of people at the Japanese Community Pioneer Center in Little Tokyo, Los Angeles, California, December 1970. Toriumi is an elderly white-haired man in suit and eyeglasses in center standing next to a tall balding Caucasian man and tall Japanese woman wearing a corsage, possible Mae Sakamoto with Christmas donation of wrapped gifts. Eleven people sit and stand around them. Christmas tree, Clock, paintings of Jesus and landscape, window with vertical blinds in background. Written on original envelope: Pioneer Community Center -- Xmas Donation -- Mae Sakamoto.